POWERED HAULAGE JUNE 2018 • E&MJ 65 www.e-mj.com © 2018 Calumet Branded Products, LLC W W W . B E L R A Y . C O M M a i n t e n a n c e C o s t S a v i n g s D e c r e a s e D o w n t i m e E x t e n d C o m p o n e n t L i f e R e d u c e C o n s u m p t i o n O u t s t a n d i n g E x t r e m e P r e s s u r e , S h o c k L o a d a n d A n t i - W e a r P r o p e r t i e s until the job is completed and everyone is in the clear." 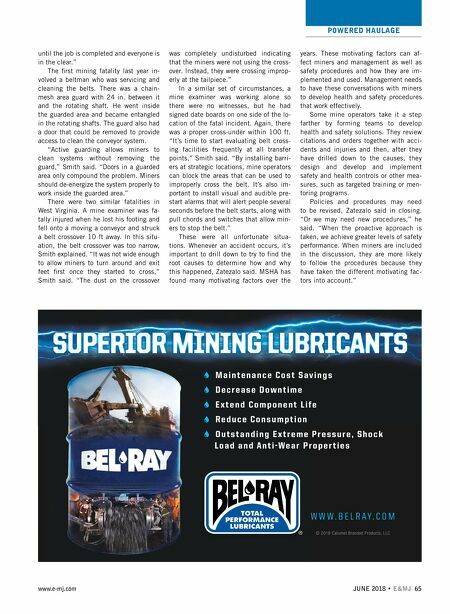 The first mining fatality last year in- volved a beltman who was servicing and cleaning the belts. There was a chain- mesh area guard with 24 in. between it and the rotating shaft. He went inside the guarded area and became entangled in the rotating shafts. The guard also had a door that could be removed to provide access to clean the conveyor system. "Active guarding allows miners to clean systems without removing the guard," Smith said. "Doors in a guarded area only compound the problem. Miners should de-energize the system properly to work inside the guarded area." There were two similar fatalities in West Virginia. A mine examiner was fa- tally injured when he lost his footing and fell onto a moving a conveyor and struck a belt crossover 10 ft away. In this situ- ation, the belt crossover was too narrow, Smith explained. "It was not wide enough to allow miners to turn around and exit feet first once they started to cross," Smith said. "The dust on the crossover was completely undisturbed indicating that the miners were not using the cross- over. Instead, they were crossing improp- erly at the tailpiece." In a similar set of circumstances, a mine examiner was working alone so there were no witnesses, but he had signed date boards on one side of the lo- cation of the fatal incident. Again, there was a proper cross-under within 100 ft. "It's time to start evaluating belt cross- ing facilities frequently at all transfer points," Smith said. "By installing barri- ers at strategic locations, mine operators can block the areas that can be used to improperly cross the belt. It's also im- portant to install visual and audible pre- start alarms that will alert people several seconds before the belt starts, along with pull chords and switches that allow min- ers to stop the belt." These were all unfortunate situa- tions. Whenever an accident occurs, it's important to drill down to try to find the root causes to determine how and why this happened, Zatezalo said. MSHA has found many motivating factors over the years. These motivating factors can af- fect miners and management as well as safety procedures and how they are im- plemented and used. Management needs to have these conversations with miners to develop health and safety procedures that work effectively. Some mine operators take it a step farther by forming teams to develop health and safety solutions. They review citations and orders together with acci- dents and injuries and then, after they have drilled down to the causes, they design and develop and implement safety and health controls or other mea- sures, such as targeted training or men- toring programs. Policies and procedures may need to be revised, Zatezalo said in closing. "Or we may need new procedures," he said. "When the proactive approach is taken, we achieve greater levels of safety performance. When miners are included in the discussion, they are more likely to follow the procedures because they have taken the different motivating fac- tors into account."